Q: US National Security Adviser John Bolton said in an interview on March 5 that the US still wants to have dialogues with the DPRK and waits positive signals from the DPRK. But he also made it clear that if the DPRK is not committed to denuclearization, it is not going to get relief from the US side. We noted that on the same day, the Choson Shinbo of the DPRK carried an article, saying that if Trump does not wish to lose forever the opportunity for denuclearization, he should take the lead in making synchronized steps towards building trust between the DPRK and the US, before the DPRK embarks on finding a "new path". What is China's take on resolving the Korean Peninsula issue after the US-DPRK summit in Hanoi? A: China always maintains that the Korean Peninsula issue can only be resolved peacefully through political dialogues. After their meeting in Hanoi, both the DPRK and the US leaders have made clear their willingness to continue with their dialogues. We recognize and encourage that. We hope that the two sides could persist in translating such willingness into concrete actions. The Korean Peninsula issue has not evolved to this stage overnight. No one should expect it to be resolved in just one day. The key is to take into account the legitimate concerns of all parties in a balanced way and consolidate mutual trust and gradually gather consensus, thus paving the way for securing a political settlement to the Korean Peninsula issue. This has been our position all along. We also raised concrete proposals like seeking a package solution and taking phased and synchronized steps, which we hope parties concerned will give some serious consideration. Q: What is China's comment on the meeting of the Joint Commission of the Joint Comprehensive Plan of Action (JCPOA) held yesterday in Vienna? A: Since the two foreign ministers' meetings in July and September last year, with the joint efforts of all parties and the broad support of the international community, our work to uphold the JCPOA has yielded positive results. We believe it is conducive to upholding the international non-proliferation regime, peace and stability in the Middle East, and upholding multilateralism and international rules in the current international landscape. The most important goal of this meeting was to consolidate the political momentum and outline the next-step moves. As you can see in the media reports, during the meeting, all parties highly commended Iran for continuing to meet its nuclear obligations compliant with the JCPOA, and the IAEA for undertaking monitoring and verification activities in a neutral, professional manner. All parties reaffirmed their commitment to firmly uphold and act upon the JCPOA, implement the outcomes of the two foreign ministers' meetings, have discussions on practical measures as soon as possible, and continue to safeguard their economic and trade cooperation with Iran. In fact, not only in this meeting, during the IAEA Board of Governors meeting which was also held this week, support for the JCPOA was also the main theme. 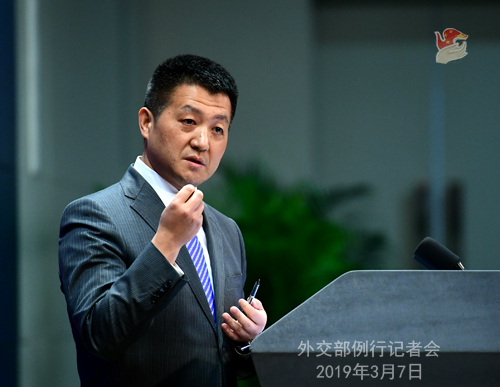 China is ready to continue working with all parties to uphold and implement the JCPOA while safeguarding our country's legitimate rights and interests. Q: Several Western countries recently have announced that their citizens who have joined the Islamic State have now been captured. They would be stripped of their citizenship and they would not be allowed to return. Now the Islamic State is collapsing. It is said that there are some Chinese that have ended up in Iraq and Syria, fighting for the Islamic State. If any of these Chinese citizens are captured, what is the Chinese government's position on them? Does China want the Syrian or Iraqi government to return them to China ? A: On the issue of counter-terrorism, we have said before that terrorism is a common challenge faced by the international community. To address this issue calls for the concerted efforts of all countries. You just mentioned that some western countries are taking actions. We still need to verify that. We would like to discuss this specific issue with relevant countries. As to the current situation, thanks to the concerted efforts, the Islamic State is falling apart in the Middle East. We hope that all countries will continue to strengthen coordination and crack down on all terrorist forces including the remnants of the Islamic State, thus rooting out the breeding ground for terrorism. I want to reiterate that China firmly opposes all forms of terrorism. We hope that the international community will enhance communication and coordination and forge synergy in this regard. Q: The US National Security Adviser John Bolton said that the US will impose sanctions on foreign institutions that have financed Venezuelan President Maduro's government. Are you concerned that Chinese companies might be affected? A: We have said before that in international relations, China consistently upholds the principle of non-interference in other countries' internal affairs. We have also said that the problems facing Venezuela now shall be resolved by the Venezuelan people themselves through consultations. History has proven once and again that external intervention including unilateral sanctions will help in no way resolve practical issues and will only complicate the situation. Cooperation between China and Venezuela has been conducted on the basis of equality, mutual benefit, common development and commercial principles. Such cooperation conforms with law and benefits the people and should not be affected no matter how the situation might evolve. Q: The UN High Commissioner for Human Rights Michelle Bachelet yesterday said that her office hopes to carry out an independent assessment of the situation in Xinjiang. Will the Chinese government allow UN human rights investigators to come to Xinjiang and carry out an independent assessment? A: We have noted relevant reports. In fulfilling their duties in a truly just and objective way, the UN High Commissioner for Human Rights and her office should first and foremost, earnestly abide by the purposes and principles of the UN Charter and respect the sovereignty of the UN member states. I am sure you have all noted that recently many foreign delegations have visited Xinjiang at China's invitation, providing the international community with better access to know the real Xinjiang Uyghur Autonomous Region. In principle, we welcome all sides, the UN High Commissioner for Human Rights included, to visit Xinjiang on the condition that they comply with Chinese laws and follow relevant procedures. However, I must also stress that those who are politically-motivated and seek to use a visit to Xinjiang as a pretext to interfere in China's internal affairs and undermine its sovereignty and territorial integrity will not be welcome. Q: A cybersecurity intelligence unit of the US company Accenture Security will release a report this week, claiming that Chinese hackers have targeted at least 27 universities in the US, Canada and Southeast Asia to steal maritime technologies for military use. I wonder what is China's comment on this? A: I believe no one will be surprised if the US institution you mentioned indeed releases such a report. It seems that for some time, several US institutions have been releasing information or reports on their fabricated stories that aim to play up their "Chinese hackers stealing secrets" theory. But if you read their "stories" carefully, you will find a common feature: the hacker attacks they described are very similar to those detailed in the NSA documents disclosed by Edward Snowden. I must say that those people do know how to launch these attacks like the back of their hands. Q: I have two questions. First, yesterday and today, the ROK President Moon Jae-in and Minister of Environment both emphasized that the country will strengthen cooperation with China on smog prevention and control. So I wonder what is China's comment? Second question, the ROK Foreign Minister said this morning that the smog in the ROK did stem from China. Do you have any comment on this? A: I will answer your second question first. Yesterday I answered a similar question, but I still want to underscore that the causes of smog are very complicated. I don't know if the ROK senior official you mentioned has based her remarks on scientific analysis, or if her conclusion can be backed up by experts. Residents in the Seoul Capital Area have made complaints on the heavy smog that has been there for several days, and we understand that the ROK government needs to address their concern. That being said, one should not look for reasons elsewhere whenever there is a problem at home. Instead, one should grasp the very nature of a problem. Only by facing up to a problem can one solve it. China believes that a scientific attitude is needed when dealing with the smog issue. Now we come back to your first question. To strengthen cooperation on smog prevention and control, as proposed by President Moon Jae-in, has been promoted by China too. The smog issue is indeed a complicated one. I believe all regional countries concerned can benefit if relevant countries can sit together to study and find out the causes of smog and ways to address it. Q: Chinese Vice Foreign Minister Kong Xuanyou had important meetings with Pakistani leaders during his visit to Pakistan. Do you have more information to share with us? A: Maybe you have seen reports on Vice Foreign Minister Kong Xuanyou's visit to Pakistan. Vice Foreign Minister Kong paid the visit at the invitation of the Pakistani government and had in-depth communication and exchange of views with Pakistan on the current Pakistan-India situation. During the visit, Vice Foreign Minister Kong met with Prime Minister Imran Khan, Chief of the Army General Qamar Javed Bajwa and Foreign Minister Shah Mehmood Qureshiand and held deep talks with Foreign Secretary Tehmina Janjua. During the talks, Vice Foreign Minister Kong emphasized that China and Pakistan are all-weather strategic partners. China appreciates that Pakistan has exercised restraint, remained calm and insisted on bringing down tensions through dialogue with India. 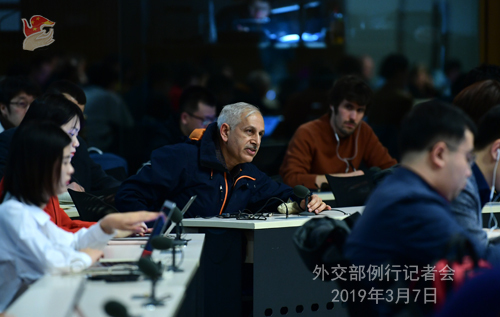 He explicitly reiterated that China believes the sovereignty and territorial integrity of all countries must be respected and that we would not like to see any action that violates the basic norms of international law. China repeats its call on India and Pakistan to refrain from actions that might aggravate the current situation, demonstrate goodwill and flexibility, and start dialogue at an early date for the sake of regional peace and stability. China will continue to play a constructive role toward this end. Pakistan expressed appreciation to China for its objective and impartial stand on the Pakistan-India situation and thanked China for its efforts to facilitate the easing of tensions. The Pakistani side reiterated clearly that it does not want to see an escalation and stands ready to resolve differences and disputes with India peacefully through dialogue. Pakistan welcomes the international community including China to play constructive roles to this end. Q: The Chinese technology company Huawei officially sued the American government, arguing it had been unfairly banned from operating in the United States on the grounds of security threats. Does the Chinese government support the Huawei lawsuit? Are there any plans in the effort of the Chinese government to join Huawei in the court of law in the United States? A: Huawei has filed a lawsuit arguing that the relevant section of the National Defense Authorization Act for Fiscal Year 2019 passed in the US Congress is unconstitutional. In fact, when the Act was adopted, the Chinese government already made serious representations to the US side to oppose the China-related negative contents in it. As for our comment on Huawei's lawsuit filed in the US against the US government, we believe it is totally legitimate and understandable for a company to safeguard its legitimate rights and interests in a lawful way. As for your question on whether the Chinese government will join the company in such lawsuits, I haven't got relevant information so far. Q: Media reports say that President Xi Jinping will visit Italy in March. Can you confirm this? A: The relationship between China and Italy has been developing well and bilateral cooperation in various fields has been moving ahead steadily. I believe that both China and Italy want to further advance bilateral relations and elevate our comprehensive strategic partnership through high-level exchanges. As for the Chinese leader's travel plans, we will let you know timely when we have relevant information to offer. Q: I was just wondering whether the Chinese Vice Foreign Minister, during his visit to Pakistan, had raised the question of terrorism originating from Pakistani soil and the need to eradicate the breeding ground of terrorism? A: As I said earlier, during his visit to Pakistan, Vice Foreign Minister Kong had deep exchange of views on the current India-Pakistan situation with leaders of the Pakistani government and military. A major concern shared by the relevant parties is regional security situation. Indeed, a lot have happened in that region and many issues are involved. 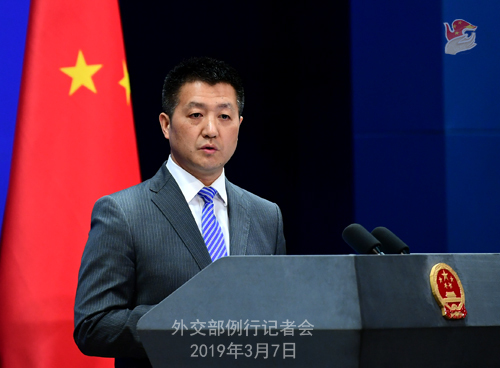 China has explicitly expressed its principled position that the sovereignty and territorial integrity of all countries must be respected and upheld. China is against any behavior that violates the basic norms of international law. We hope Pakistan and India will take positive measures to enhance mutual trust, accumulate consensus and meet each other half way so as to ease tensions and keep the region peaceful and stable. Vice Foreign Minister Kong has had broad and deep discussions on the relevant issues with leaders of Pakistan's government and military. The Press Center for the Second Session of the 13th National People's Congress (NPC) will invite State Councilor and Foreign Minister Wang Yi to hold a press conference on China's foreign policy and foreign relations at the Media Center at 10:00 am on Friday on March 8. The regular press conference of the Ministry of Foreign Affairs will be adjourned on Friday, March 8 and resumed on Monday, March 11.